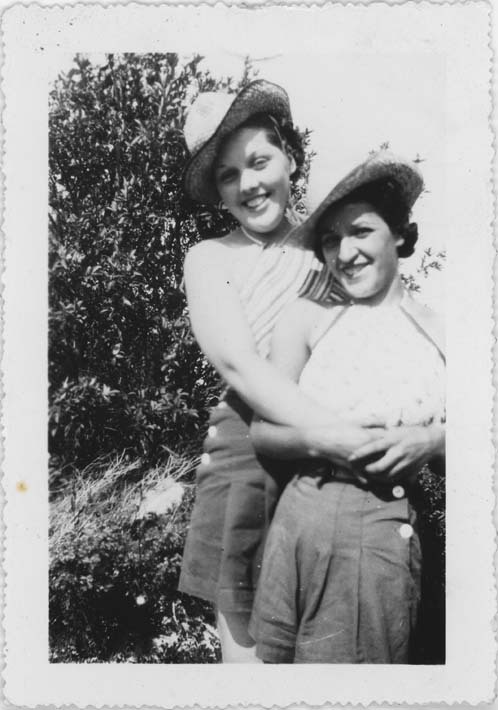 This is a black and white snapshot of Antoinette (Toni Ciccarelli) with an unidentified woman. The woman is hugging Toni from behind and they are both smiling into the camera. They are wearing similar outfits: a sleeveless light coloured top with patterns, high-waisted shorts with large white buttons on the side, and a large brimmed straw hats. Their hair is styled pulled back underneath the hats. They are shown from knee up. The background shows a tree amids tall grass and shrubs.